All transactions are safe and secure with a reliable history in online purchasing behind each of our associates. 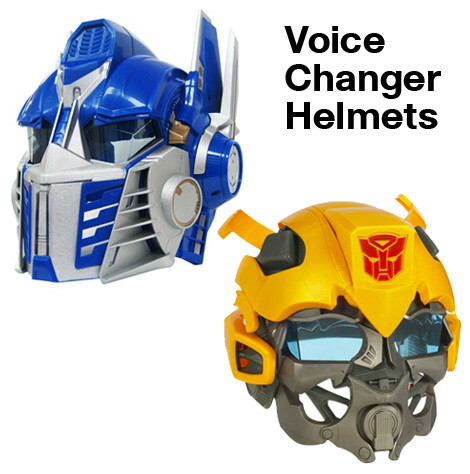 Buy the Transformers Optimus Prime Voice Changer Helmet, Bumblebee Mask to own Transformers clothing and merchandise. These Bumblebee and Optimus Prime voice changer masks allow you to talk like an Autobot. Adjustable for both kids and adults, the voice mixer Transformers helmets are great for fans of any age. Disguise your voice by speaking into the built-in microphone or press a button to play pre-recorded character phrases. Use them to cap off the perfect Transformers costume or t-shirt. Get your hands on these bestselling collectable masks while you still have the chance. In addition to the Transformers Optimus Prime Voice Changer Helmet, Bumblebee Mask above, browse the Transformers Clothing Gallery for more apparel like men's and women's clothes, kids shirts or hoodies.